‘It is not in the stars to hold our destiny but in ourselves.’ Wisdom from the Baird. I’m not sure. I like to think it’s a bit of both – probably to absolve myself of some responsibility at least. Either which way, Emma and Richard had the most perfect wedding day. She was the most relaxed bride and looked absolutely stunning in an Audrey Hepburn-esque lace overlay dress. The sun was out and shining bright. The day began in a beautiful church in the village Emma grew up, with a newly ordained, groovy vicar. Everyone was delighted to get out of the heat of the sun for a short while to enjoy some cracking, traditional hymns and to watch Emma marry Richard. A gorgeous yellow vintage Rolls Royce picked up the bride and groom and took them to Gate Street Barn – a gorgeous modern oak barn in the Surrey Hills a few miles from Guildford. Guests applied suntan lotion, enjoyed Pimms and canapés while we had an amazing time exploring the gardens for our photo shoot. 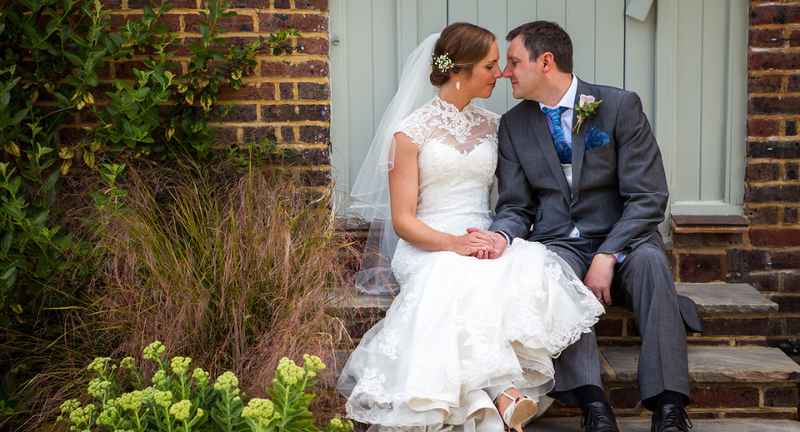 Surrey wedding photography, and a good barn wedding, is such a treat. The Barn looked gorgeous with dusky pink roses on the tables and bunting and greenery on the ceiling.